Hitler’s ego spawned World War II’s largest and most futile tank design, which became the mouse that never roared. As early as 1941, the German high command had visions of military technology that was far ahead of its time, and many innovative technological concepts were becoming reality. Had some of them been produced in a more expeditious fashion or in greater numbers, most historians agree that they would have doubtless prolonged World War II, if not altered its outcome entirely. Many of these “wonder weapons” were highly practical concepts and have as their progeny the cornerstones of modern military arsenals— the world’s first assault rifle, intercontinental ballistic missiles, and jet fighters to name a few. And then there were some bizarre concepts, which appear on the surface to be nothing more than an extension of their inventor’s ego. The Maus (German for “Mouse”) super-tank certainly falls into the latter category. The Panzerkampwagen (PzKpfw.) VIII Maus was a 188-ton behemoth developed by Porsche at the behest of Hitler himself. Impractical does not begin to describe it, and the timing of its introduction was stupefying. Why, when Nazi Germany had lost the oil fields in Africa and was starting to run short of fuel for the vehicles they had, would they introduce a gas guzzling monster that would obviously be very costly and time consuming to produce? This kind of decision making was one of the great intangibles about Hitler, which confounded his staff as much as it does modern observers. Hitler jumped from one fad and crazy idea to another. The Maus was probably influenced by a trend toward producing heavy tanks that many Allied armor developers were experimenting with during the middle years of World War II. Of course Hitler had to go them one better. 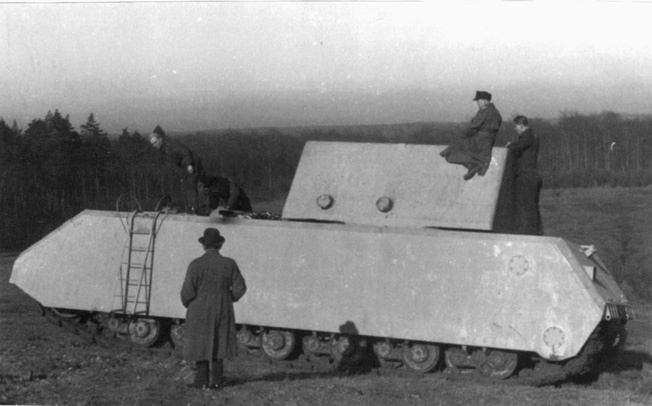 A 1944 prototype of the gigantic Maus, a Nazi super-tank conceived by Porsche. Few were completed, and the design was later viewed as a dismal failure. The Americans were developing the 45-ton M-26 Pershing tank, and, of more personal concern to Hitler, the Russians debuted the 45-ton JS-2 Stalin. While most military planners would have been more focused on the thousands of Soviet T-34 medium tanks the Russians were churning out that would eventually be rolling toward the Fatherland, Hitler obsessed with outweighing and outgunning the handful of Allied heavy tanks that were going into production. After the D-Day invasion and the Allied experience of being bogged down in the hedgerows of Normandy, heavy tanks were a subject of major controversy among military planners on both sides. Were they worth their weight? Did they gain more in protection and firepower than they sacrificed in mobility and fuel economy? Hitler had presumably already made up his mind several years before this defining incident and ordered Porsche to get to work. The earliest development of the Maus super heavy tank started in 1941, when Krupp began studies of super heavy Soviet tanks such as the KV series. In early 1942, Krupp produced designs of a hybrid Tiger/Maus prototype, which eventually became the PzKpfw. VIII, and another super heavy design, the predecessor of the Maus, known as the the PzKpfw. VII Lowe, or “Lion.” In early March 1942, the order for the heavier tank, the Maus, was placed, and the Lowe never reached the prototype stage. Later that month, Porsche received the official contract for the new 188-ton Maus, specifying that it was to carry 100 rounds of ammunition and would be armed with the high performance 105mm L/60 or L/72 gun. The contract set a deadline for an operational prototype to be developed by the spring of 1943. On June 23, 1942, Porsche provided its design for an improved Maus armed with turret mounted 150mm (L/37) and 105mm (L/70) guns. Porsche promised that its first prototype would be ready in May 1943. While contract specifications demanded that armament should consist of the 150mm L/40 gun and 20mm MG151/20 heavy machine gun, usage of the 128mm L/50 was under consideration. In December 1942, new armaments such as a 127mm naval gun and the 128mm flak gun were also tested and considered for the tank’s main gun. In January 1943, Hitler interfered again in the development of the vehicle and ordered that the Maus be fitted with turret mounted 128mm and 75mm guns, while turret mounted 150mm or 170mm guns were specified for future use. Instead of the standard 7.9mm coaxial machine gun, the Maus would have a 75mm antitank gun next to the main gun, and a machine cannon for antiaircraft was to be mounted in the turret roof alongside a smoke grenade projector. Indecision seemed to reign supreme on this crucial design element. The specification for ammunition storage space of 100 rounds was never met, and consequently the space was decreased, sacrificed at the altar of even further armament modifications. That same month, the first backsliding by Porsche began when it was restated that first vehicle would be ready in the summer instead of spring 1943, and that would be followed by the production of only five vehicles per month. The first official name for the new super tank was VK10001 Porsche Type 205 and nicknamed the Mammoth. The tank was renamed Maeuschen (or “Mousy”) in December 1942 and finally Maus in February 1943. The prototype has a weight in place of the 50 ton turret. With Krupp producing hulls, turrets, and armament, a firm called Alkett was responsible for assembly of the components. On December 24, 1943, the first prototype, minus the turret, was completed by Alkett and was put through extensive tests. 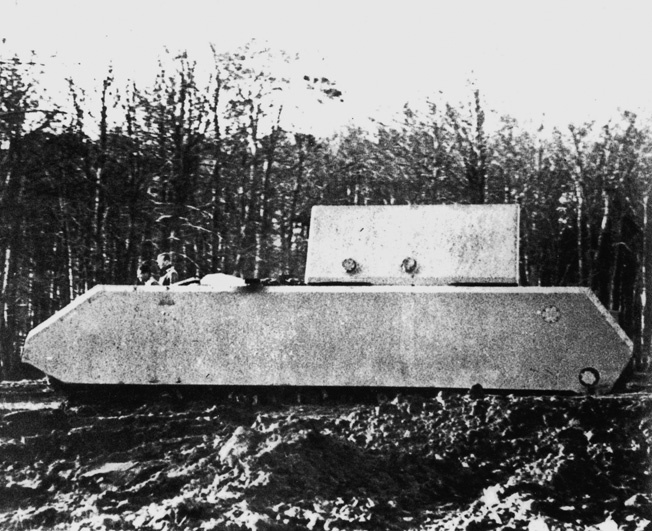 During the tests, the Maus could barely move due to its enormous weight. It became obvious that the powerplant was woefully inadequate. The first prototype was powered by a modified Daimler-Benz MB 509 engine (developed from the DB 603 aircraft engine), which could not provide the planned speed of 20km per hour. It could manage only 13km per hour, and that only under ideal conditions. In December 1943, the V1 prototype was fitted with a Belastungsgewicht, or simulated turret, which represented the weight of the actual turret, and was tested. For some curious reason, this first prototype was applied with camouflage paint and marked with a red star, hammer, and sickle and disguised as a captured Russian vehicle. In March 1944, the second prototype Maus V2, which differed in several details from the V1, was finally finished. This new V2 lacked a powerplant, which was later fitted in mid-1944. On April 9, Krupp delivered the turret, which was mounted on the V2 and tested in June. It was mounted with a 128mm KwK 44 L/55 gun, a coaxial 75mm KwK 44 L/36.5 gun, and a 7.92mm MG34 machine gun, providing the Maus with enormous firepower. The Maus main gun could penetrate the front, side and rear armor of the American Sherman, British Cromwell and Churchill, and Russian T-34 and JS-2 tanks at ranges over 3,500 meters. Its own armor was no thinner than 7 inches anywhere, and was up to 14 inches thick at some points. The turret included mounts for a Zeiss rangefinder, but it was not fully finished and some of the missing components were shipped later. The Maus I was to be fitted with Krupp’s second turret, but it was never delivered and remained fitted with a simulated turret. On July 25, 1944, Krupp reported that two hulls would be available soon and two more were in production. Two days later, Krupp was ordered to scrap all four hulls. On August 19, Krupp informed Porsche that it was ordered to stop further work on the Maus. By September 1944, however, testing had begun on the second prototype. It was installed with a Daimler-Benz MB 517 diesel engine that made little difference in comparison with the previously used engine. Designing an engine sufficiently powerful for the gigantic Maus was obviously a serious problem. Though the Germans tried two engines, both around 1,200 horsepower as compared to the Royal Tiger’s 590 horsepower, neither could provide a speed of more than 10 to 12 miles per hour. Another interesting feature of the Mouse from the engineering point of view was the return from torsion bar suspension—such as was used in the PzKpfw. III, the Panther, the Tiger, and the Royal Tiger—to a spring suspension. An improved torsion bar design had been considered but was abandoned in favor of a volute spring type suspension. Its running gear was designed by Skoda and consisted of double wheeled trucks supported by 12 return rollers with 43.3-inch wide tracks. In order to reduce the ground pressure so that the tank could have some mobility, the tracks had to be made very wide. With the tracks taking up over 7 of its 12 feet of width, the Maus presented a very strange appearance from either the front or the rear, and its 12-foot height gave it a very high target profile. The width had to be kept to a maximum of 12 feet so the Maus could fit on rail cars, as this was intended as a primary means of transport, and a special 14-axle railroad transport car was produced by Graz-Simmering-Pauker Works in Vienna just for the Maus. Despite some ongoing major developmental problems, the Maus certainly gave designers latitude to experiment with some advanced features, which they had always been anxious to install in tanks. One of these systems was an auxiliary power plant. This plant permitted pressurizing of the crew compartment, which in turn meant submersion capability when fording rivers and better protection from gas and chemical weapons. The plan was for the Maus to be able to ford rivers up to 45 feet deep, but in practical terms it could really ford only about 25 feet, still an impressive depth. This was necessitated by the fact that most bridges would not support the weight of the Maus. The crew had to be provided with oxygen supplied by built-in fans and ventilators for use when all the hatches were closed. Besides sealing of hatches and vents, aided by pressurizing, submersion was to be made possible by the installation of a huge cylindrical chimney or trunk so large that it could serve as a crew escape passage if need be. The tanks were intended to ford in pairs, one powering the electric transmission of the other by cable while its partner stayed on shore. The process would be repeated in tag-team fashion, but would seem to raise the question of what would be done with the last tank in line! The auxiliary power also permitted cabin heating and battery recharging. An advanced electric steering system was used to steer the vehicle. The electric transmission was in itself an engineering experiment of some magnitude. This type of transmission had first been used on the big Elefant assault gun in 1943 and was considered by some German designers as the best type of transmission for heavy tanks. Weighing over 100 tons, the Maus was ungainly on the battlefield and proved to be prone to mechanical failure. 1944, further trials took place at the armored vehicle proving grounds in Kummersdorf, near Berlin, and then at the Porsche proving grounds at Boblingen. Tests were long, delayed by continuing engine failures and production problems caused by Allied bomber attacks on German factories. During these tests, it was determined that in case of any engine failure each Maus would have to be towed by two other Maus tanks, another crippling revelation as to the impracticality of the Maus. Despite all of its technological innovations, the Maus was fraught with problems and was as vulnerable to close-in attack as any other tank, if not more so. The large hull openings and many grills necessary to ventilate the massive power plant were a particular disadvantage. The amount of space the power plant consumed necessitated an external auxiliary fuel tank in the rear, which was a considerable fire hazard. Design studies found at Krupp by the Allies showed a version of the Maus named the Bear, carrying a 305mm breech-loading mortar. The Bear was a giant 1,500-ton vehicle with an 800mm gun as its main armament and two 150mm guns in auxiliary turrets on the rear of the vehicle. This improbable design, put forth by two engineers named Grote and Hacker, was planned to be powered by four U-boat diesel engines. It is also reported that Germany began work on a design called Flakzwilling 8.8cm auf Maus, which was to be a Maus mounted with a modified turret housing two 88mm Flak 43 guns and used as a heavy antiaircraft tank. Typical of Hitler’s vacillations on his many super weapon projects, on November 4, 1943, development of the Maus was ordered to cease, and only one was to be completed for further evaluation. In October 1943, the original order placed by Hitler for 150 vehicles was also cancelled. It was becoming apparent that as German ground forces were consistently losing the battle with Allied air superiority, a monstrosity like the Maus would be extremely vulnerable to air attack. Some sources state that according to Porsche, Hitler’s true aim for the Maus was to plug holes in the Atlantic coastal defenses on the Western Front, where its limited range and mobility would not have been as much of a hindrance. But that this plan was thwarted by delays in production which pushed any possible delivery date well past D-Day. One version of the demise of the Maus states that the V2 prototype was destroyed by personnel at the Kummersdorf proving grounds, while some sources relayed that the V2 actually saw combat while defending that same facility. According to other sources, however, the two experimental Maus tanks were sent into action in the final days of the war—one at the approaches to the Army staff headquarters at Zossen, the other near Kummersdorf. None of these accounts can be verified and seem unlikely given that the disassembled remnants of the Maus that were discovered by Allied troops. When the war ended, a nearly completed V1 turret and third hull were found at the Krupp facilities in Essen. One fully assembled example with the V2 turret mounted on the V1 hull was tested in Russia in 1951 or 1952 and can be seen today at the Museum of Armored Forces in Kubinka near Moscow. Although only two prototype Maus vehicles were ever built, and they were apparently never even equipped with their armament, it was a spectacular and fanciful vehicle. Alas, the Maus remained for the most part a figment of its creators’ imaginations. Whereas such a heavy tank might conceivably have had some limited military usefulness, it will be more remembered as a drain on German engineers and production capabilities in the last three years of the war, when Germany could least afford such a waste of dwindling resources. Tags Adolf Hitler, Africa, Allies, Allis, American, antitank gun, Axis, battlefield, Berlin, British, Camouflage, cannon, CIA, D-Day, Daimler-Benz, EAM, ELAS, Features, Ferdinand Porsche, Flak, German, Germany, Krupp, machine gun, Mary, Maus Tank, military, Mortar, Moscow, museum, Nazi, Nazi Germany, Normandy, NSA, OSS, Panzer, Paris, Porsche, POW, Russia, SAS, Stalin, Tanks, Tern, the d-day invasion, The Western Front, Troy, U-Boat, Vienna, weapons, Western Front, Wii, WIN, World War I, WWI, WWII, wwii vehicles.